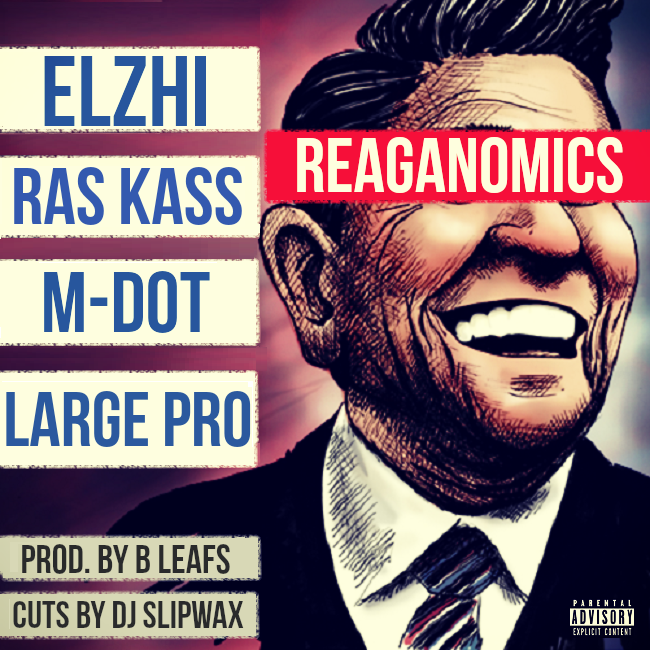 Home / MUSIC / ELZHI, RAS KASS, M-DOT & LARGE PRO "REAGANOMICS"
ELZHI, RAS KASS, M-DOT & LARGE PRO "REAGANOMICS"
Elzhi, Ras Kass, M-Dot and Large Pro is one of the most legendary line-ups you're going to see this year. "Reaganomics" is a legacy that's endured almost four decades and is more relevant now than it was back in the 80's when the [Anti-Robin Hood] concept was scribbled down on Bonzo's napkin. For those in the dark about the system, it's where corporations/wealthy lined their pockets from the taxation of the middle class, creating huge national debt and unredeemable budget deficits which forced future administrations to cut funding for social programs. 4 legends tackle the topic with their 4 unique perspectives, in the 4 unique styles you know and love them for. "Reaganomics" is produced by B Leafs off his upcoming debut album "The Horizon" out Jan 29th.